Jerry T. lives with his wife and five children in Gwee Town, Todee District, Montserrado County. 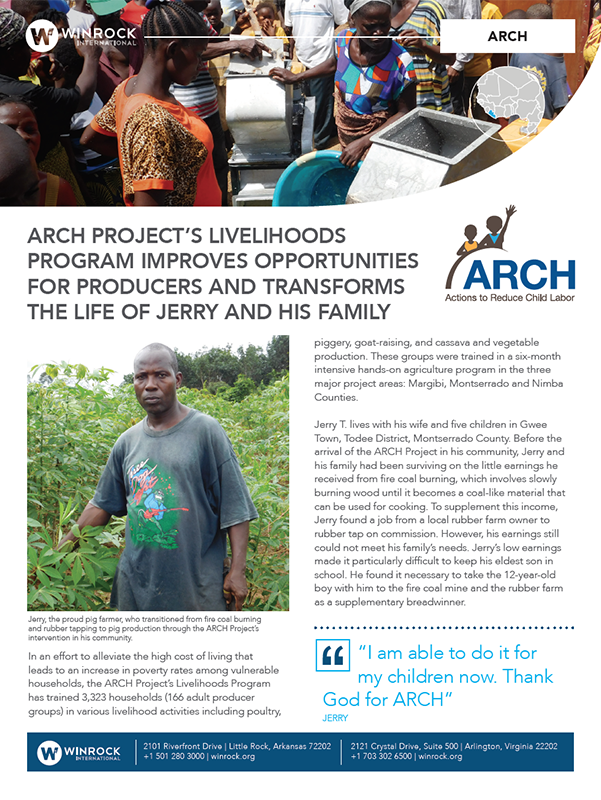 Before the arrival of the ARCH Project in his community, Jerry and his family had been surviving on the little earnings he received from fire coal burning, which involves slowly burning wood until it becomes a coal-like material that can be used for cooking. To supplement this income, Jerry found a job from a local rubber farm owner to rubber tap on commission. However, his earnings still could not meet his family’s needs. Jerry’s low earnings made it particularly difficult to keep his eldest son in school. He found it necessary to take the 12-year-old boy with him to the fire coal mine and the rubber farm as a supplementary breadwinner.